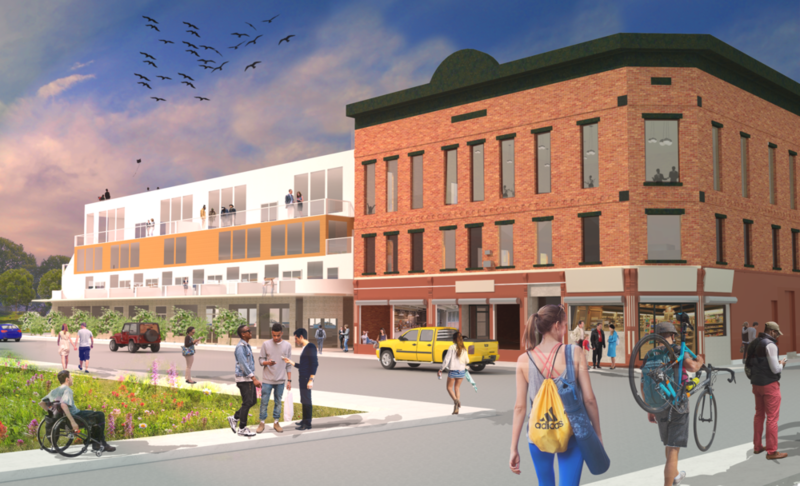 In accordance with a smart growth redevelopment plan, the city of Brockton is developing transit-oriented developments in the Campello neighborhood. This includes densification strategies like mixed-use, repurposing of existing historic structures, and the creation of public amenities like green spaces. The regenerative design approach was employed to arrive at recommendations like on-site water treatment, rooftop renewable energy generation, reduction in impervious surfaces, and diverse plantings. ...is predicated on asking the question, "What don't we know?". Following this process of inquiry leads to insights that can delight and inspire. The Brockton urban agriculture plan evaluates the benefits of and obstacles to urban agriculture in Brockton, explores community visions of what urban agriculture could look like in Brockton; and offers recommendations to help the community coordinate agriculturally related efforts and develop sound policies supporting urban agriculture. Two principle conclusions of the project were to take the time necessary to engage the immigrant and communities of color that have been chronically underrepresented in past policy and planning initiatives and connect existing efforts and use those successes to build out other aspects of the food system. Click here to view the report in its entirety. Following in the footsteps of a 2013 endeavor between the Nimpuck Cultural Preservation Inc. and the Conway School, the Nipmuc community and education center suitability study identifies opportunities for the tribe to meaningfully connect with their ancestral culture and language and invigorate a sense of place based on natural heritage. An exhaustive assessment of land opportunities for a proposed cultural center led to the conclusion that alternative options for siting this cultural center maybe within the considerations of the Nipmuc moving forward. Click here to view the plan in its entirety. ...can be generally defined as the capacity for a socio-ecological system to absorb stresses and maintain function in the face of external stresses imposed upon it by climate change anD adapt, reorganize, and evolve into more desirable configurations that improve the sustainability of the system, leaving it better prepared for future climate change impacts. A poorly planned building needed a landscape renovation to increase accessibility, aesthetic appreciation of the prominent location, and the coordination of multiple uses and users. The design focused on the entrances as a phase 1. Strategies for dealing the massive stormwater runoff from the large structure and compacted soils also doubles as a seating and outdoor educational space when dry. Click here to view the plan in its entirety. is about catching up to the present and planning for an elusive future. Dynamic changes are underway at a massive, centuryold mill building in Easthampton, MA and future home of recording studios, residences, small industry - and three distinct outdoor spaces. 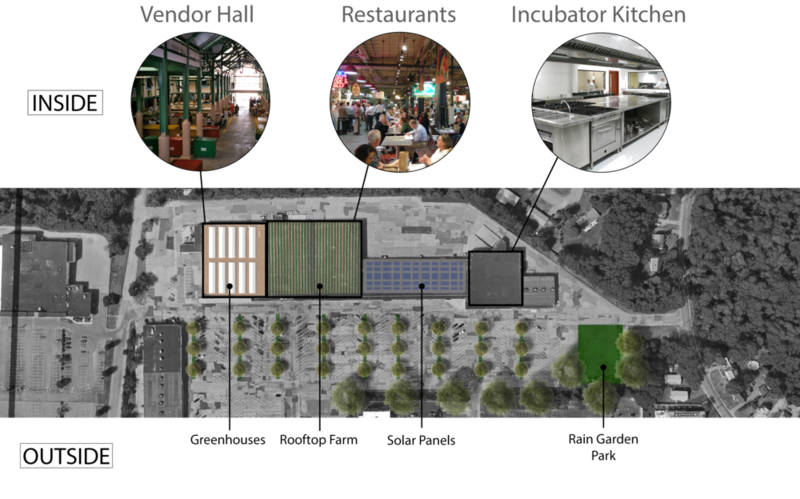 Each space was designed to accommodate a specific use ranging from a multi-season outdoor event space to ecologically-integrated parking lot that manages stormwater effectively on the heels of the mill river - all while honoring the architectural and historical legacy of the building. Click here to view the plan in its entirety. The most effective and nuanced solutions emerge from members of the community who interact with the landscapes regularly. The community of Belchertown is coordinating the construction of accessible trails with the redevelopment of the fomrer Belchertown State School property. 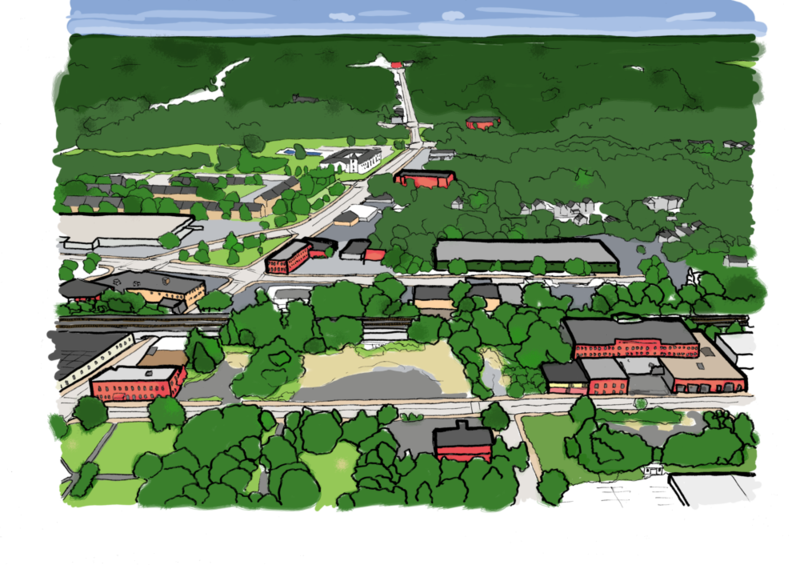 This trails master plan works to connect this redevelopment internally while linking it to nearby recreational fields, schools, downtown Belchertown, and regional trail system. Sustainable trail design and construction is a critical element and focus of this plan, as is honoring the historical and cultural significance of the former Belchertown State School, enabling visitors to enjoy the splendor of the natural landscape in acknowledgment of its past. Click here to view the plan in its entirety.